Wide leather straps on the shoulders connect to oversized D rings for a powerful piece. This harness works well on masculine genders, average to large sized. Men with even larger chests should also consider the Extra Wide Shoulder Harness. The dramatic 3" beveled D-rings are connected by 3"wide leather straps across the top of the shoulders, giving this harness a pleasurable heft and a playful "gladiator" inspired look. 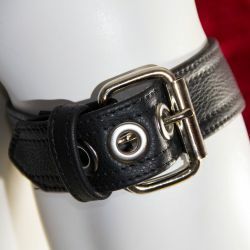 Please provide a couple of basic measurements when you place your order, and we will custom make the piece just for you. 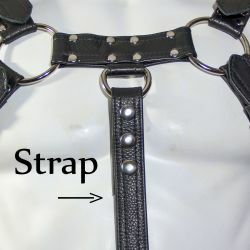 Large durable metal snaps allow for adjustment.